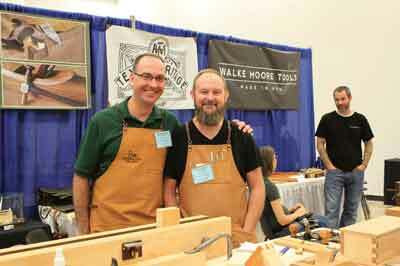 As I walked into the Benton Convention Center in Winston Salem, NC for Woodworking In America 2014, I was met by the smell of fresh sawdust and the low rumble of conversations around me paired with the tinking of hammers, the 'shoop-shoop-shoop' of plane shavings being taken, and the high pitched hum of a few power tools. 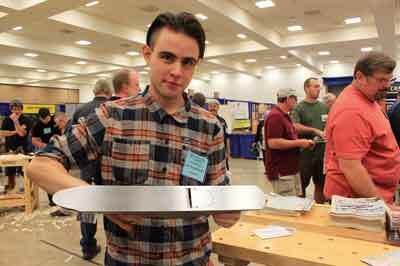 I was immediately met by Megan Fitzpatrick, Editor of Popular Woodworking magazine and she gave me a hug. As a girl in woodworking, Megan is the embodiment of my dreams. She has gained a skill and success matched by few of either gender. Starstruck, I think I muttered something about cats and how she was my idol. I'm choosing to pretend that we had a very engaging conversation about woodwork and that I didn't look like a total idiot! Her hugs were followed by those of 'friends' I'd met on the social media website Instagram. We all greeted each other as old friends would, even though this was the first time we'd ever actually met in person. After introductions, I decided to do a walkthrough of the marketplace. By 6pm, when the doors were to close, I'd only made it to six of the 55 vendor stalls. Everywhere I turned, there was a new friend to be made, a new tip or trick to be learned and memories were made during those three days that will last a lifetime. Never have I come across a group of such genuinely amazing people. Day two started with a bustle of activity as people attended classes, shopped in the marketplace, made new friends and ogled all the pretty tools. 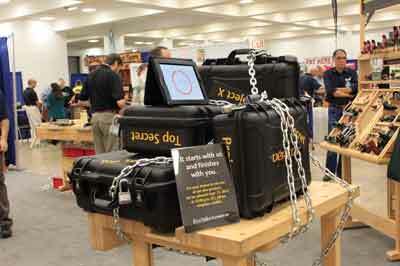 The Lee Valley booth had a curious looking bench with boxes labelled 'Top Secret' and 'Project X' chained to its top. A countdown till high noon on Saturday piqued the curiosity of everyone. Megan Fitzpatrick and a few other high profile woodworkers had alluded to a big reveal to come from Lee Valley during WIA, so when 11.30am on Saturday rolled around, a crowd began to form around and anticipation of the announcement added a palpable tension to the air. After much anticipation, Robin Lee, president of Lee Valley Tools, stepped up to the bench, unlocked the chains and opened the first box. Inside, was the culmination of three years of intensive work and development, resulting in their new line of completely customisable bench planes. Robin called the new line 'the Build-A-Bear' of tools. 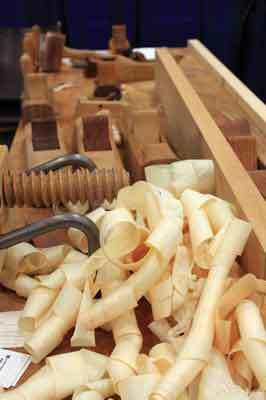 The new line of Veritas custom bench planes will be available in sizes 4, 4 1/2, 5, 5 1/2, and 7. 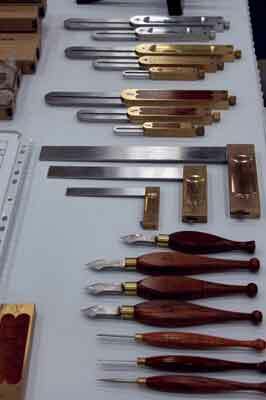 From surface prep to jointing, these planes will be able to handle any planing task. 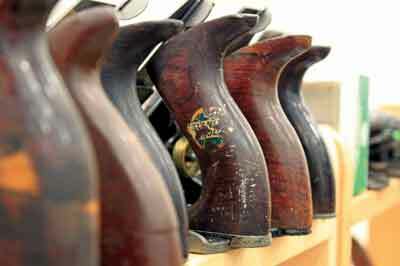 The planes feature a Norris style adjuster, an adjustable toe and holes in the plane body casting to which a fence can be mounted. Knobs and totes are also available in various sizes and widths, so the user can select their favourite handle preference. Standard frog angles of 40, 45, and 55° should cover most applications, but - and here's where they really shine - frogs can also be custom ordered at any angle between 40 and 65° in .5° increments. Blades can be ordered in either O1 or PMV steel. I had the chance to spend about 45 minutes using each of the different planes and was very impressed. I spend the majority of my time using vintage tools, so the engineering and precision of Veritas tools is always a nice surprise. One aspect that stood out to me was the weight of the planes themselves. Upon first glance, they appeared much lighter than they actually were. A nice, thick, rounded chunk of steel behind the frog is both visually appealing and greatly adds to the heft of the plane, making it easier to control, capable of entering and leaving a cut with less tear-out, and yet, not so heavy as to tire the user out after hours of use. All in all, this is a very slick idea and a great new line of planes. The launch went very well with the crowd. What followed was my most memorable experience at WIA. 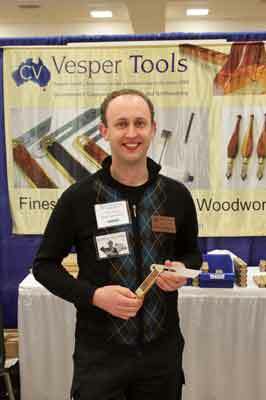 A little nervous about talking to another woodworking 'celebrity', I approached Robin Lee to ask him a few questions with regard to this article. As we said hello, my nerves were instantly calmed. He was so approachable, so genuine and kind. Having purchased many Veritas tools, I have, on multiple occasions personally experienced their amazing customer service. Meeting Mr. Lee, I began to understand why they have such a quality customer service. Robin Lee cares deeply about his product and customers. Not once in our conversation did I hear anything about a 'bottom line'. 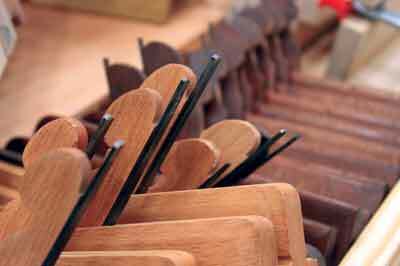 Instead I repeatedly heard his desire to provide heirloom quality tools at affordable prices. In an increasingly digital age, so many people work all day at a computer and never get to see the physical results of their labour. His desire is to get working tools into the hands of everyone with an imagination so they have a chance to feel the incredible sense of accomplishment that accompanies producing physical goods with one's own two hands. Our conversation wandered away from the customisable planes to travel in China and other places, how I got my start in woodworking and our mutual desire to encourage and inspire the younger generations to put down their digital devices and pick up a tool or two, to create, even if for just a few hours a week. I walked away from the conversation feeling so excited and inspired and I knew I had made an incredible new friend. I would never have expected the president of such a huge, influential company to be so genuine and down-to-earth. I hope everyone reading this article gets a chance to meet him someday. 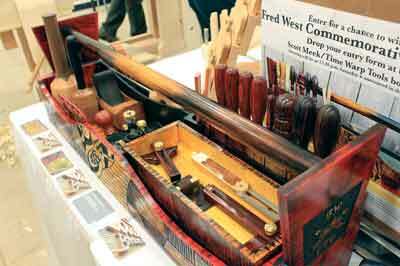 Other convention worthy mentions were the drawing for the Fred West Commemorative Tool Chest - a beautifully made tote by Andrew Gore filled with hand tools and media donated by 16 individuals/organisations - and the Popular Woodworking Jet bandsaw giveaway. Congratulations are in order to Carl C. Hein, who walked away with the Tool Chest, which, with its contents, was valued at over $5,000 and to Todd Nebel, whose truck looked pretty stylish driving away with that 430mm bandsaw in the back. 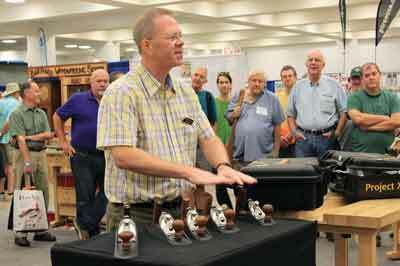 In addition to the giveaways, off campus meet ups and Marketplace fun, WIA14 offered a stellar lineup of speakers, bragging such names as Roy Underhill, the PBS hand tool woodworking star, Frank Klausz, Graham Blackburn, Don Williams, and Peter Galbert. 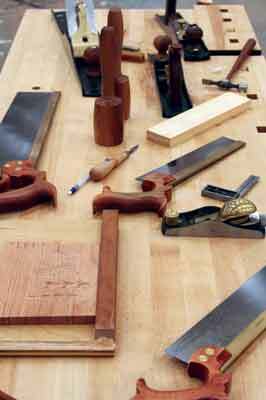 While I wasn't able to attend any of the classes, I had the chance to meet Roy Underhill, who is responsible for much of my hand tool woodworking knowledge. My impressions in our brief meeting were that he is just as jovial, personable and fun to be around as he seems on screen and that he's much taller than I expected! As the convention drew to a close and we all packed up to leave, we knew none of us were saying goodbye, we were saying "see you later" to new friends from a life changing experience few of us will soon forget. 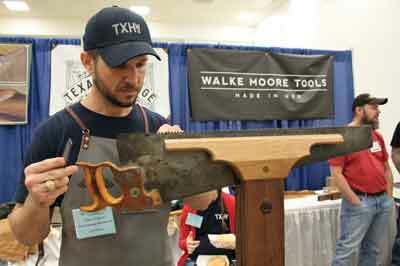 For those that love the solidarity of woodworking, who cherish the unique independence and self-sufficiency being a lone woodworker gives you, and who want to celebrate their accomplishments privately, carry on. 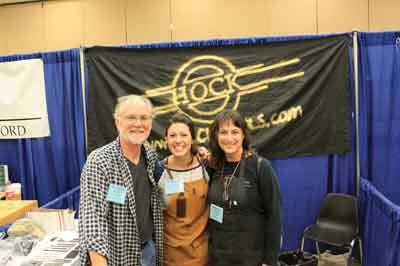 For those who want to be part of a rich community, where knowledge is shared freely, where you can laugh with new and old friends, nerd out over tools, techniques and woodworking celebrity, where one can find the tools and encouragement needed to build their own masterpieces, please join us at WIA 2015. Woodworking, for me, will never again be a solitary craft. The dates of the 2015 event are yet to be finalised but we will bring you more details when they are made available to us.